Robots will replace a growing number of jobs in industries including automotive and electronics in the next few years, particularly in east Asia, according to The Financial Times (Feb.10, 2015). Worldwide sales of industrial robots rose 23% last year and are on course to double (to 400,000) by 2018, driving radical change in many manufacturing sectors. 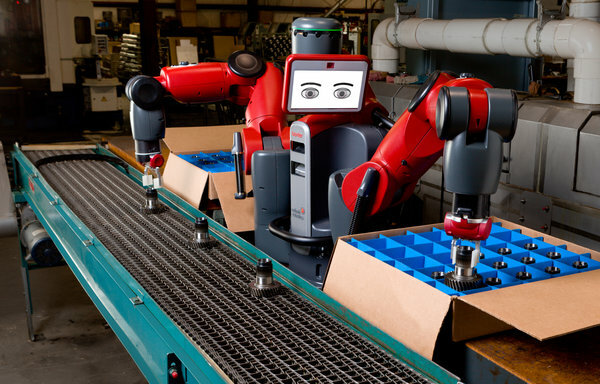 Although robots have been used in industry for decades, recent advances in technology have cut their costs and increased their capabilities, as a new generation of reprogrammable, multipurpose machines comes into service. The prices of industrial robots have been falling steadily, dropping about 14% in the past 4 years to $133,000 for a typical system, while capabilities have been expanding. Some robots are even cheaper: the Baxter robot from Rethink Robotics has a listed base price of $25,000, making it accessible to smaller companies that might have found it difficult to invest in earlier generations. The fastest adoption will come in South Korea, Taiwan and Thailand, which have heavy concentrations of the industries that are capable of high levels of automation, higher labor costs than some of their regional competitors, and limited employment protections that would prevent job cuts. Other relatively rapid adopters are expected to be China, Japan, the US, the UK and Canada. The countries likely to be slowest to embrace the new robots include more heavily regulated economies of Europe including France, Italy and Spain, as well as Brazil and India.